What had 113 breweries, 5 homebrew clubs/shops, around 368 beers, ciders and meads, and 10 pods all in one place? 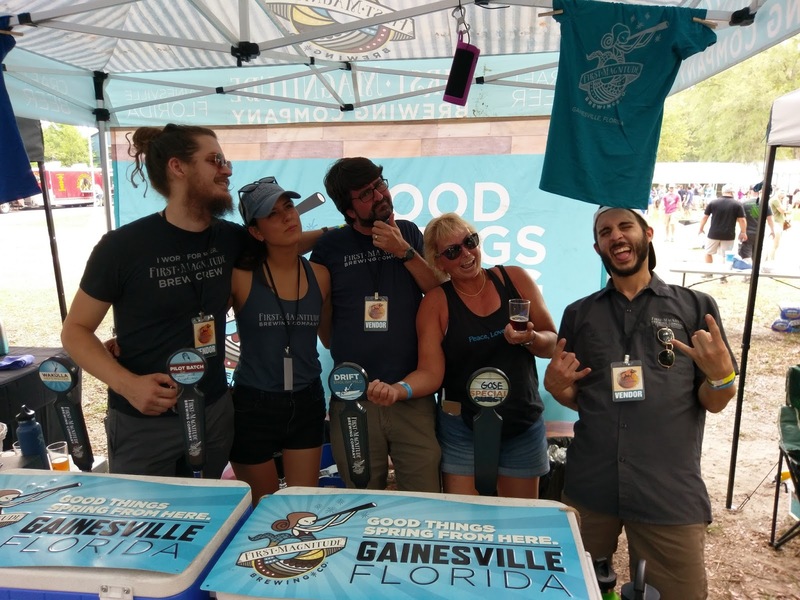 Answer: the Sixth Annual Hogtown Craft Brewers Festival, presented by the Hogtown Brewers in Gainesville, Florida on Saturday, April 22! Craft beer enthusiasts descended upon Gainesville's Tioga Town Center for the 1pm start of the annual beerfest that features breweries from all across Florida, in addition to regional, national and international breweries. Weather was perfect for beer sampling, with a mix of sun and clouds. What more could you ask for? 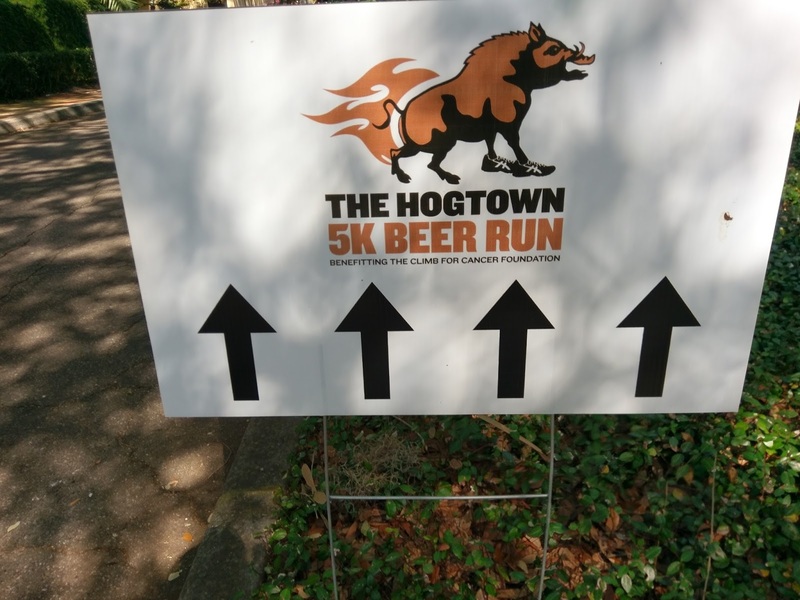 For some, though, it was an entire day of festivities, as things heated up at 9am at the Haile Plantation Village Center with the Hogtown 5k presented by Gainesville's Swamp Head Brewery. The 5k is an annual fundraiser for Climb for Cancer Foundation. 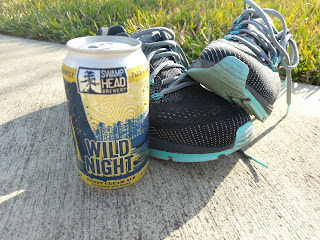 Yes, there was Swamp Head beer, and pizza, at the end of the run, in case anyone needed extra motivation. This year, the 5k included a separate .5K Root Beer Run for the kids. 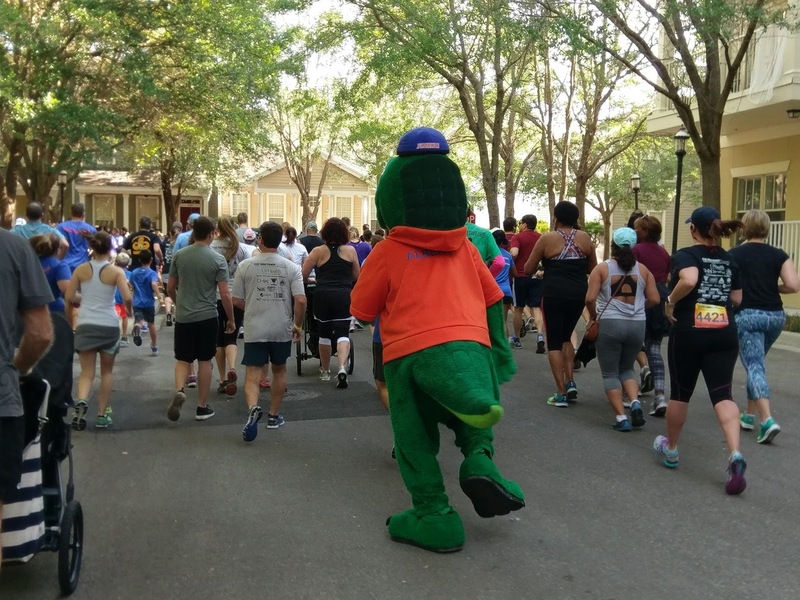 A record number of 501 runners entered the run this year. 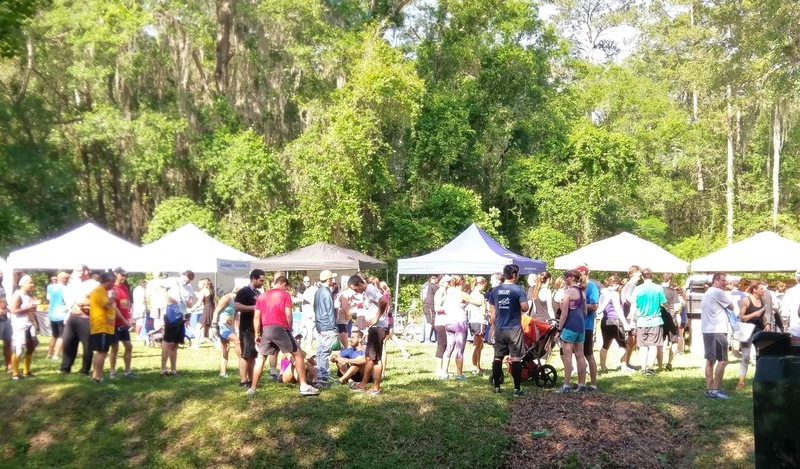 The 5k course winds through the trails of the Haile Plantation, a picturesque golf course community. Once again, members of the Gators Marching Band were on hand to get the crowd fired up ahead of time. 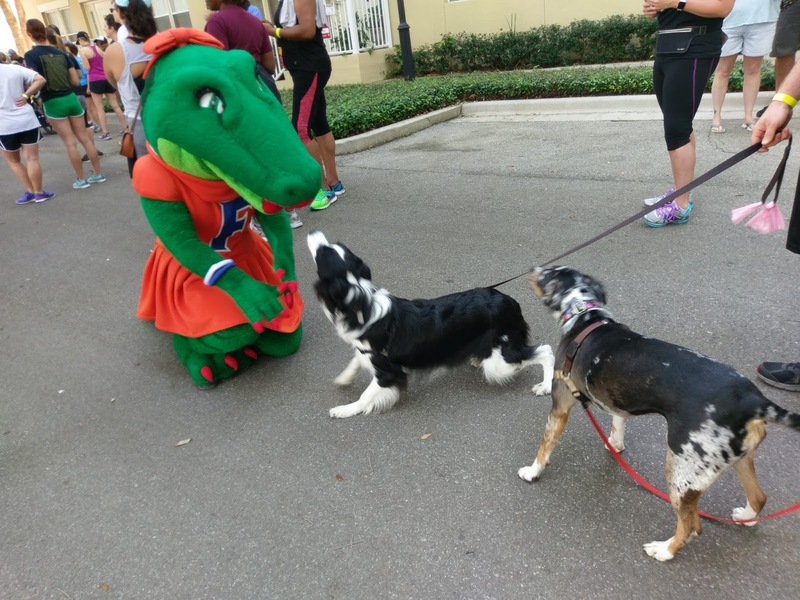 Albert and Alberta from UF were also on the scene to welcome runners, families, and even the four-legged types. Then the countdown began, and the runners were off! 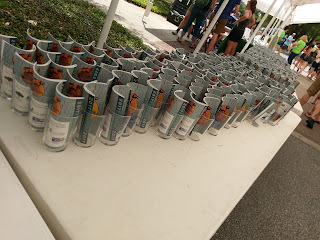 About halfway through the run, the water station loomed large, and thoughts may have been turning to that Swamp Head beer just a short 1.5 miles away (or, was that just me?). 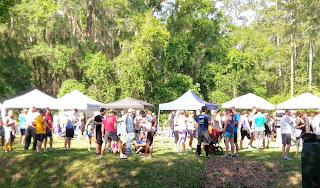 Back at the finish line, the Swamp Head tent was one popular place. 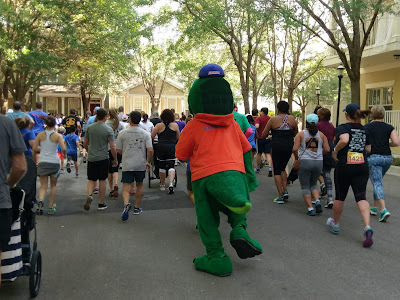 The 5k winners, who seem almost superhuman, were announced. It was another great year at the Hogtown 5k! 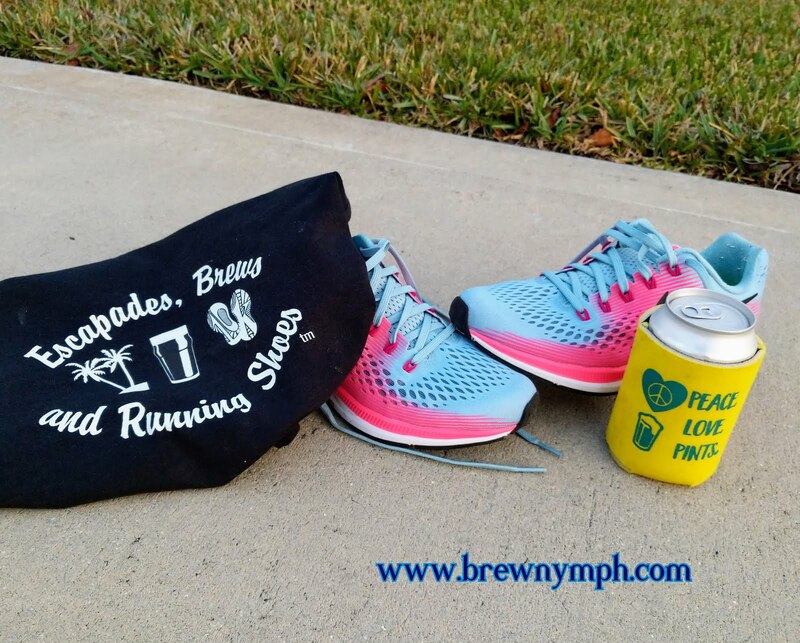 Cheers to 5k and beer! Thanks to Swamp Head Brewery! 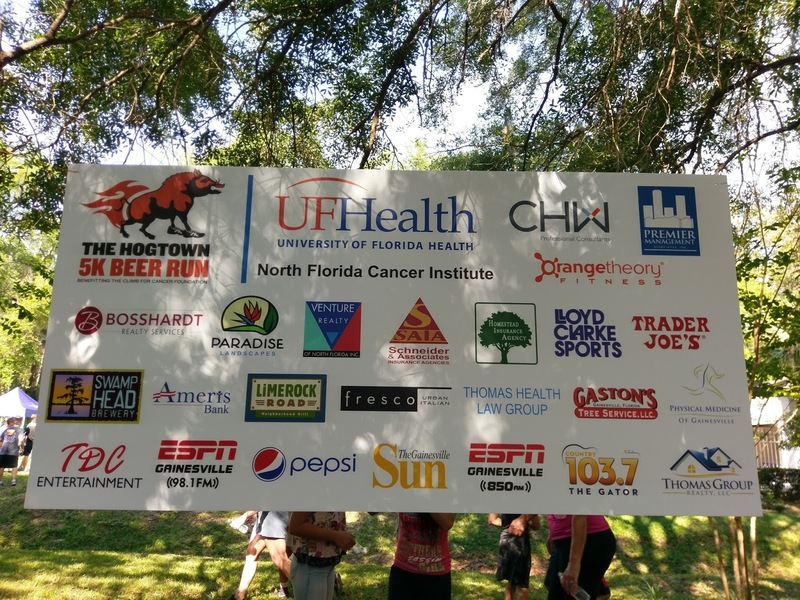 And, all the 5k Sponsors! Just under two hours later, and after a change of clothes, it was time for the Hogtown Craft Beer Fest! This time marked my fifth year in a row attending the Fest, so five out of six ain't bad! Check out the 2016 recap story. As expected, tickets to the fest sold out earlier in the week, and if you snoozed on those, well, you were out of luck, because tickets are not available on fest day. So, read on, and don't let those tickets get away from you in 2018! 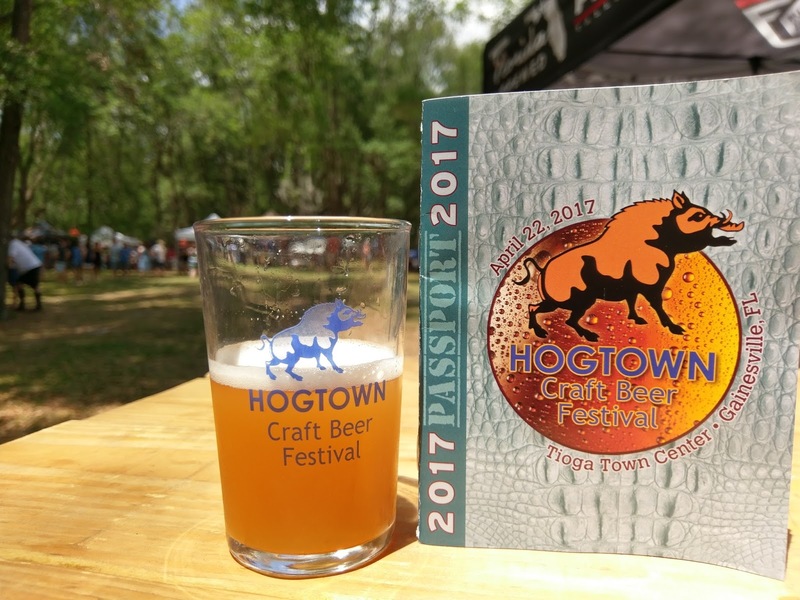 Even before the Fest started, information was available via the new Hogtown Fest app, which provided a summary of the breweries, beers, timed tappings, fest map and more. Enter the fest, pick up your glass and the fest Passport, and you were good to go! 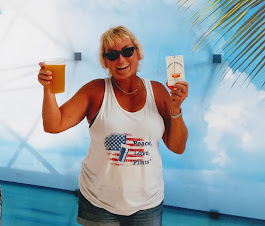 Between the app and the printed passport, you had everything right there in your hand ...except one of the many beers (the first of which didn't take too long to find)! 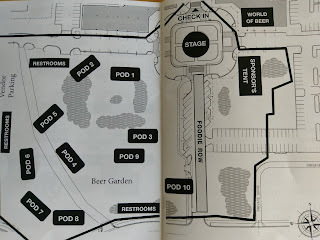 Unique to this fest is the arrangement of breweries in "pods," generally according to geographical area, and that map really is handy! 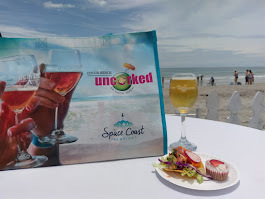 The organizers do a great job with the open set-up, which covers plenty of space and allows attendees to move around freely without rubbing shoulders with everyone else who wants to get a beer (of course, if you're into that, especially after a few samples, ok by me). Not surprisingly, the "Gator Country" Pod was busy all afternoon! 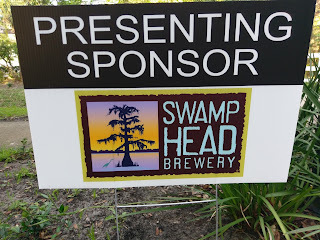 Local breweries Swamp Head, First Magnitude, Alligator and Blackadder were all present, along with up-n-coming Cypress & Grove, among others in this group. 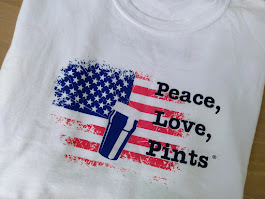 I caught up with John Denny and crew of First Magnitude Brewing, while I sipped on a Molé Drift English Mild Ale, a special treatment of the core Drift, with cacao, cinnamon and subtle hints of chipotle. I had stopped at First Magnitude for some Friday night pre-gaming the night before, and noted how much I loved the Black IPA. I'm no stranger to First Magnitude (you can find more stories about them on this site). 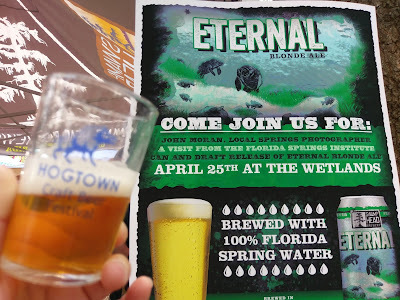 Meanwhile, over at the Swamp Head tent, one of the featured beers was the Eternal Blonde Ale, brewed with 100% Florida Spring Water. The brewery featured a roll-out of the beer in cans on Tuesday, April 25. This is another good go-to beer: crisp and lighter. I never made it to the first timed tapping of Swamp Head's Chocolate Truffle Udderly Calm Milk Stout, but looking at the line, I'd say that those who tasted it got a mouthful of goodness. 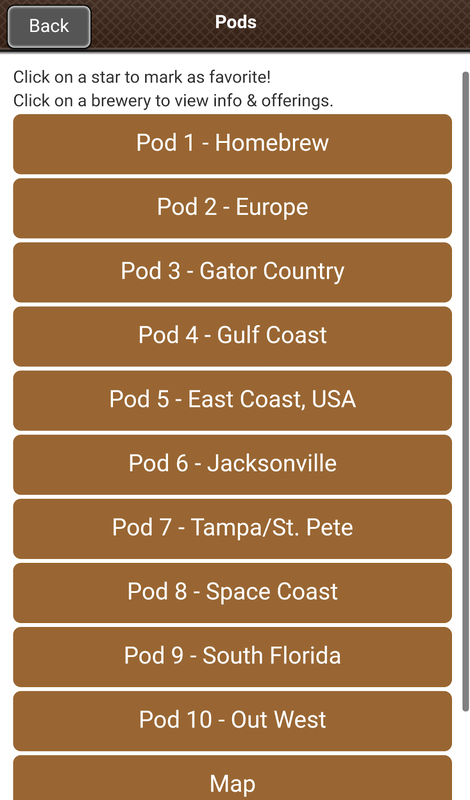 Maybe that's part of the reason why the Enchanted Forest bordered Pod 3. With all of the breweries at this fest, it's impossible to visit each one -- especially with all the talking that seems to happen (or is that just me?). 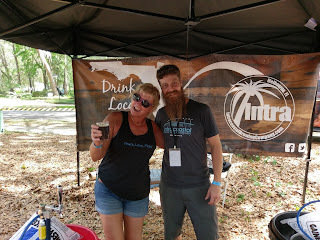 I managed to see some familiar faces and meet some brewery reps for the first time. 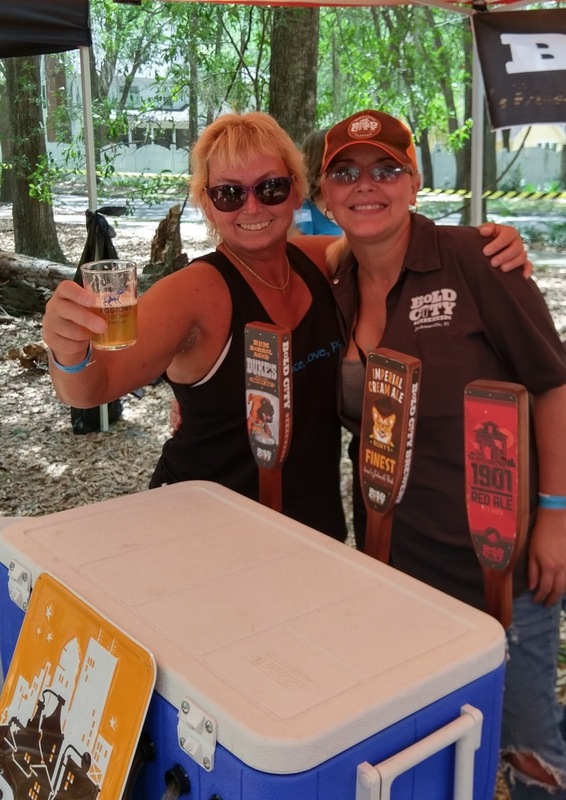 A couple of Space Coast breweries are always on my list -- not only because they're fun guys, but because the beers are solid. Intracoastal Brewing (Melbourne) poured a tasty Black Walnut Amber Lager that had the aroma/flavor of, well, you guessed it-- Walnuts. 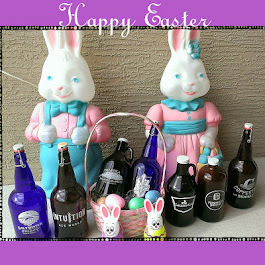 The Coffee Brown Ale was brewed with local roasted coffee beans and was a very pleasant, smooth coffee beer. Usually, you'll find co-owners John, Kyle and Donald at a fest, along with several of the Intra crew, but Kyle decided to get married the night before (the wedding was held at the brewery!). Somehow Donald made it. I guess we'll give John and Kyle a pass this time around. With Intra's Brewmaster Donald. Another round of great beers! Just one tent to the right were Jimmy and Jonathan from Hell 'n Blazes Brewing (Melbourne). 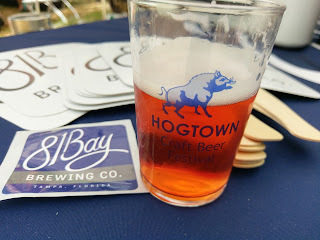 Because HnB just opened last June, this was the first time the brewery attended Hogtown (see prior stories on this site). 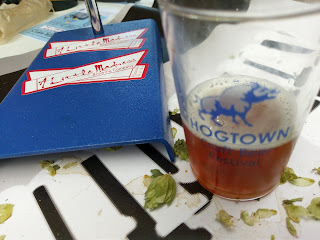 The Strawberry Lager was a crisp not-too-sweet delight, and the Hamilton Chocolate Porter was a bit of cocoa heaven. And, the HnB guys are always good sports! No, I didn't kick that keg. Cool truck, by the way. 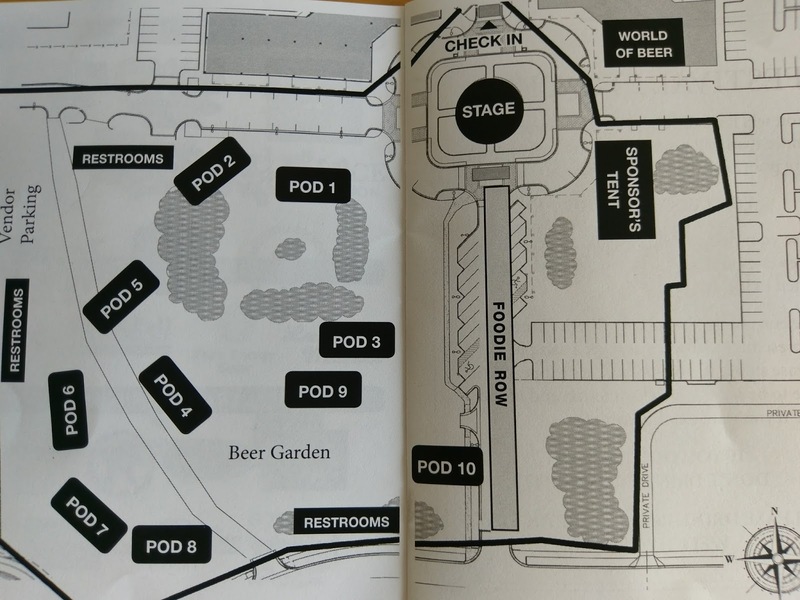 The Jax area had the whole cadre of breweries in attendance in Pod 6. 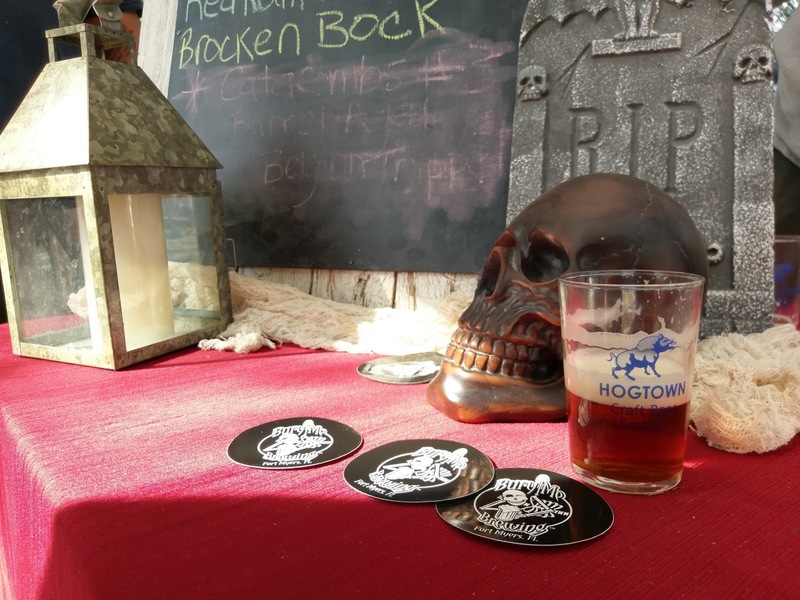 The Wicked Barley crew had a steady line at their first Hogtown fest. And, of course, I had to stop at the Bold City Brewery tent to visit with Regina and Whit (even though I interrupted their lunch). New to the Jax craft beer landscape is Legacy Ale Works, owned by Matt and Liz Jacobs. They're looking for a spot to house their proposed 5-barrel system and tap room in the Mandarin area of Jax, so stay tuned for more. They poured two beers, Red Run Red IPA and Hive Five Honey Pale Ale, while also handing out feedback cards looking for comments about their beers. The Honey Pale Ale was a refreshing take on the pale ale, with the addition of the honey for some extra body and a hint of sweetness. 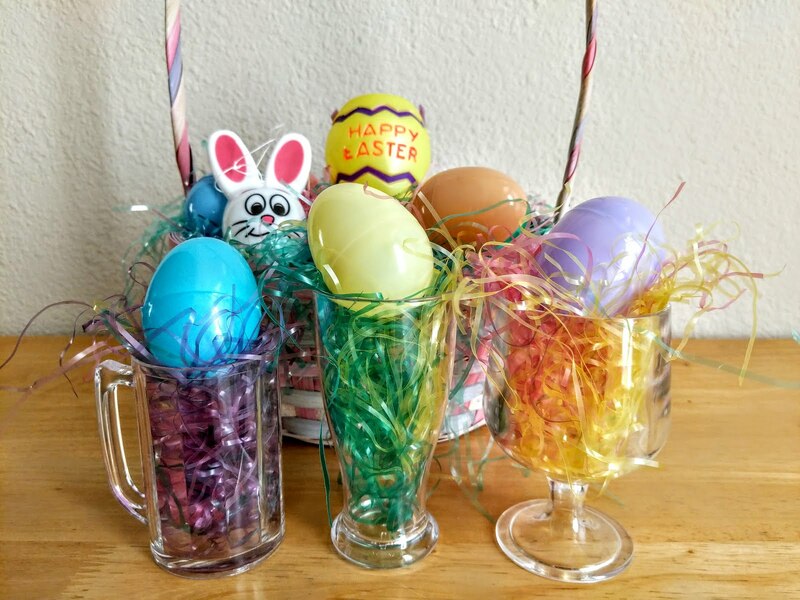 The Red IPA took on hoppy citrus notes along with the caramel of a red. I'm looking forward to the progress of their new venture. Awesome meeting them! Somewhere along the way, hunger sets in. Food trucks lined one end of the fest in Foodie Row. Like last year, a large covered beer garden area with plenty of tables and seats provided a great spot to sit for a while, eat, or listen to a few tunes. High-top tables were scattered around fest grounds, offering a place to put that beer and keep your hands free. Several charging stations also were provided. Another cool thing offered by the fest was water -- free bottled water in little wading pools. No matter which way you turned, there was a pod of beer! 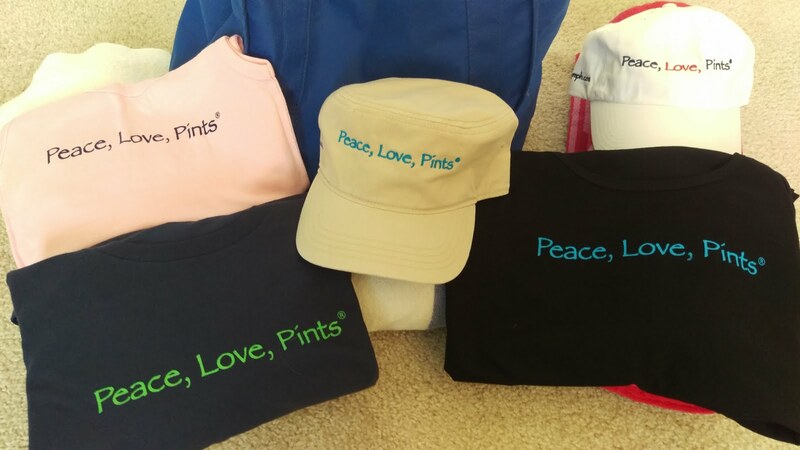 And, more opportunities to meet new breweries. 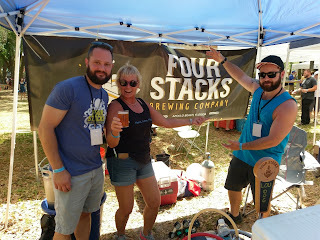 I met the guys from Four Stacks Brewing (Apollo Beach) for the first time, and enjoyed the Lou Dog Blonde Ale, named after the band Sublime's dog. 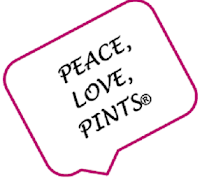 Great chatting with them, and another brewery on the list to visit! 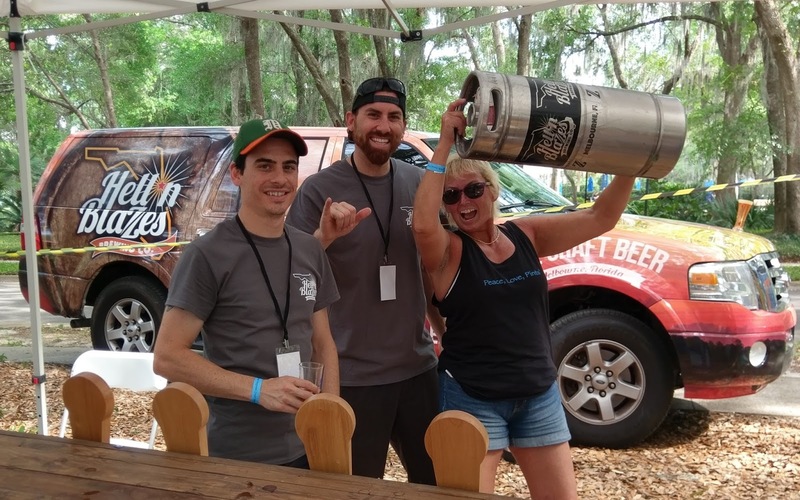 Another Tampa-area brewery expanding its distribution footprint is 81 Bay Brewing. I have seen them at a couple of earlier fests. 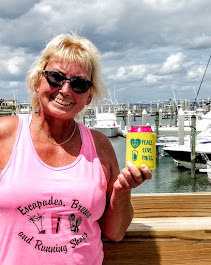 This time, I had heard a lot of positive comments about the Ramble On Raspberry Ale, and, indeed, the beer was a fruity treat, while not being overly sweet. Last year, I met the guys behind A Little Madness Brewing (Pensacola), a brewery-in-planning. It was cool to catch up with them again, and they're looking towards an opening date later this year. The Emilia 777 ESB (at 7.77 ABV) was well-balanced and easy to drink. Another one to follow. 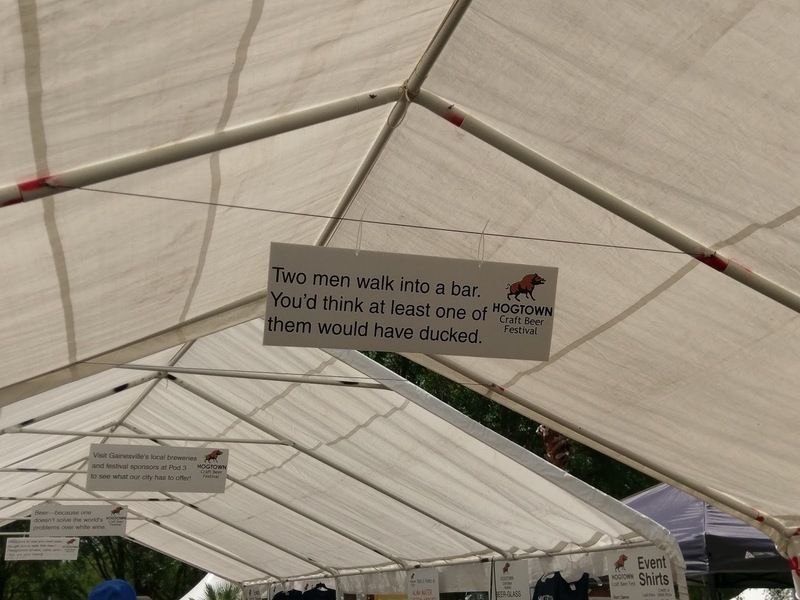 By this time, it was somewhere after 4pm, with under an hour left in the Fest. 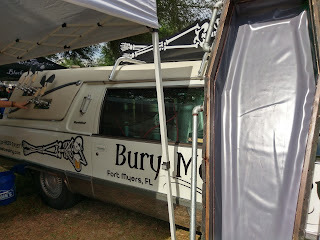 It seemed appropriate that as things started to wind down, I would end up at Bury Me Brewing (Fort Myers). Yeah, with a name like that, you can only imagine the props and the beer names: Catacombs, From my Cold Dead Hands, and Soulless. I savored the sinfully good Brocken Bock Doppelbock, true to the malty, toasty style with caramel notes. This is another one for the brewery visit list. Check out the tap handles on the brewery vehicle - what do you call that, a tap hearse? 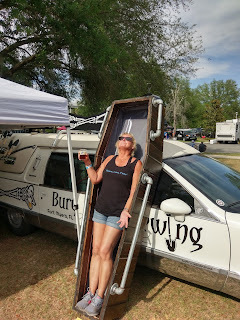 And, with props like that, what would you do, especially near the end of a beerfest? You can caption it, but it was kind of a heavenly experience (on the Highway to Hell, most likely, though). 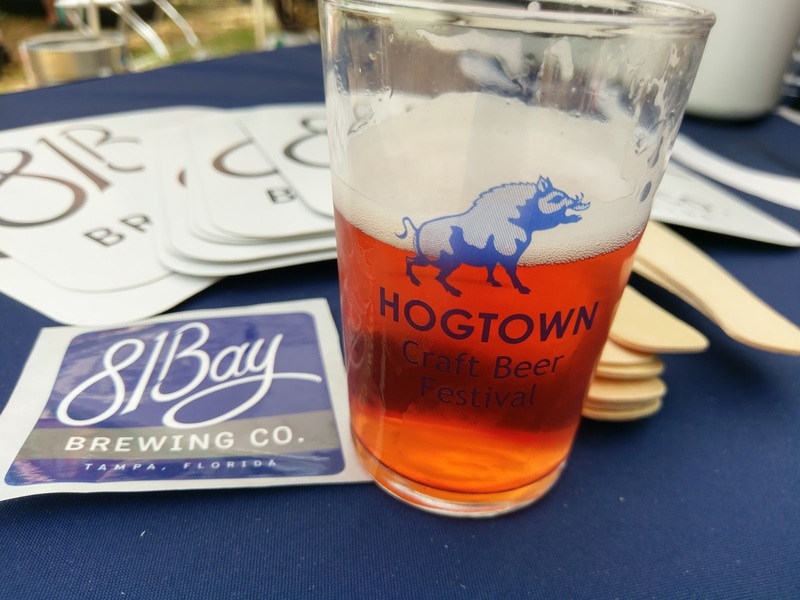 Shout out to the Hogtown Brewers for a job well done! 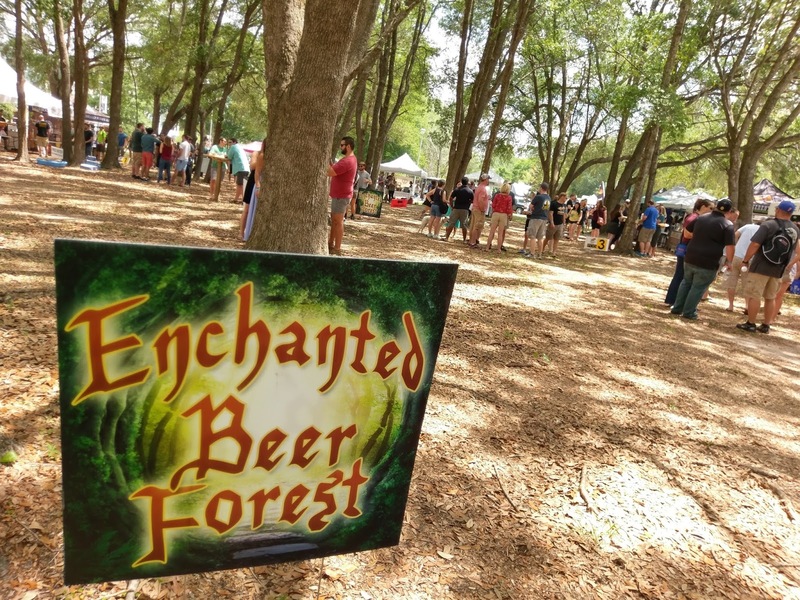 It's also good to know that the fest benefited several charities: Alachua Conservation Trust, Rebuilding Together, Lubee Bat Conservancy, and United Way of North Central Florida. 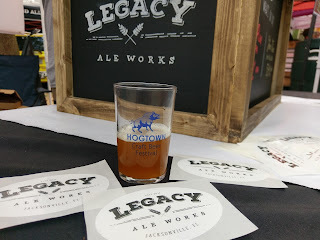 It was another awesome time at my fifth Hogtown Craft Beer Fest. 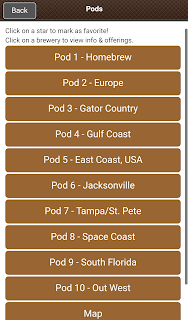 By the time next year's Fest rolls around, there will likely be a number of new Florida breweries added to the pods. 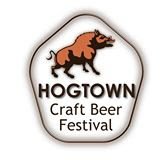 When the calendar turns to 2018, just remember that when it's April, it's time for Hogtown. Trust me on this, don't let those tickets pass you by for the Seventh Annual Fest! 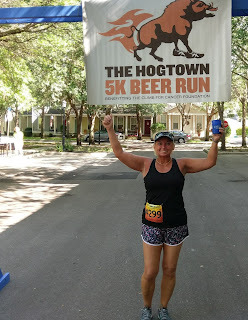 I had a blast again at Hogtown! I always have a great time visiting Gainesville. I love how conservation-minded the community is, and the local breweries really step up for the environment, among other causes. I'm looking forward to another trip during the summer. 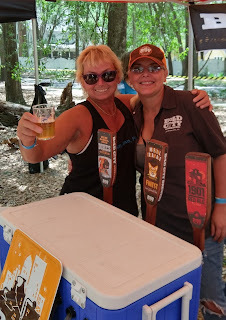 That's a wrap on this beerfest, but be sure to check out the events pages on brewnymph.com for upcoming beerfests and special beer events across Florida, along with daily tappings and such around the Jax/North Florida area! 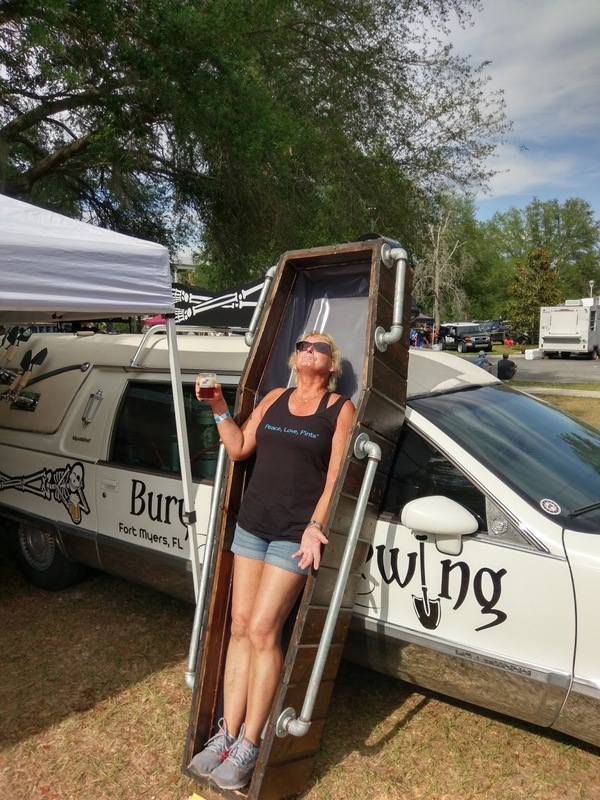 Thanks for reading, and see you around a beer Somewhere in Florida!